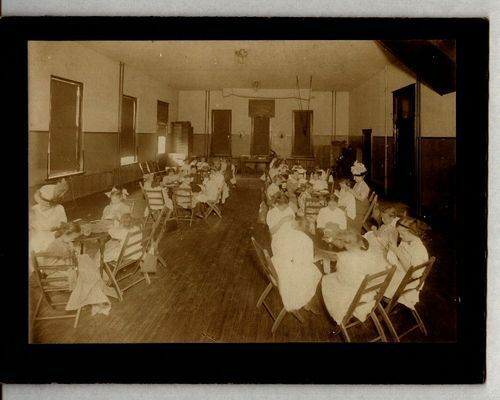 This sepia colored photograph shows a sewing class at the Topeka Provident Association building in Topeka, Kansas. The charitable organization was established in 1904 at 335 Jackson Street in response to the needs of victims who were recovering from the devastating flood of 1903. Some of the services provided by the association included: cooking and sewing classes for girls, a boy's club, a library, a day care center and a men's dorm. For several decades the Topeka Provident Association provided assistance to people in and around the Shawnee County area until 1951 when the organization changed it's name to the Family Service of Topeka.